The Department of English is requesting $105,648 ($110,648 less a $5,000 cost share from the UCF Libraries) to purchase access and perpetual rights to Early American Imprints II: Shaw-Shoemaker 1801-1819 from Readex, a Division of NewsBank, Inc. In consultation and collaboration with several academic departments and the UCF Libraries, The Department of English, is asking the Technology Fee Committee to approve the purchase of Early American Imprints, Series II: Shaw-Shoemaker, 1801-1819 from Readex. The Shaw-Shoemaker collection provides a comprehensive set of American books, pamphlets and broadsides published in the early part of the 19th century. It is based on the noted “American Bibliography, 1801-1819” by Ralph R. Shaw and Richard H. Shoemaker. It contains more than 4 million pages from over 36,000 imprints, among which are many of the rarest materials published in early America. The imprints in the Shaw-Shoemaker collection are indexed and grouped by genre, subject, author, history of printing, place of publication and language. Subjects include the following: abolitionism, Bible societies, canals, Embargo Act, fur trade, Hartford Convention, Lewis & Clark Expedition, Louisiana Purchase, nationalism, Panic of 1819, Romanticism, Seminole War, Tippecanoe, Treaty of Ghent, U.S. Military Academy, War of 1812 and hundreds more. 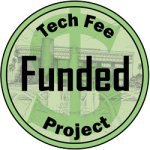 Important to note is that UCF Libraries continues to use both state and technology fee funding to pursue digital collections of historically significant works. Top research universities in the U.S., including the University of Florida, have purchased Shaw-Shoemaker 1801-1819. UCF currently has perpetual ownership to Early American Imprints, Series I (1670-1800 (Evans). With approval of this technology fee proposal for Early American Imprints, Series II: Shaw-Shoemaker, 1801-1819 the committee would greatly enhance the importance and value of this collection and greatly extend our holdings of all early American imprints in a single cost-effective purchase. This is made possible because of a unique offer negotiated with Readex as part of the technology fee process. As part of the current offer, UCF will also gain perpetual ownership to two important supplements. The Shaw-Shoemaker Supplement collection contains 974 works that fall within the 1801-1819 scope of the Shaw-Shoemaker collection, but which were missed by the bibliographer and have since been discovered and collected by the Library Company of Philadelphia. Adding perpetual ownership of this supplement to the proposed purchase will provide UCF students and faculty with a comprehensive, gap-free version of this seminal American research collection. The Evans Supplement Collection contains 1,080 works that fall within the 1639 to 1800 scope of the Evans collection (which UCF owns), but which were missed by the bibliographer and subsequently identified and collected by the Library Company of Philadelphia. UCF would gain perpetual ownership to this supplement that would provide UCF students and faculty with a comprehensive, gap-free version of this foundational early American imprint. These Readex databases are delivered online and available 24 x 7. The collections will be accessible to all students on campus or off campus through Shibboleth authentication. One hundred percent of UCF students and faculty could have simultaneous access to these outstanding resources. There are no limits to the number of users who can access the content at a given time. The content within each of these databases will be easy to discover through the library catalog or librarian-created LibGuides. Patrons will also discover this content through subject databases, and internet search sites such as Google and Google Scholar. The content is in PDF format and is easily printed, e-mailed, or downloaded to read on a cell phone, laptop, or any computer. The collections are of potential benefit to the entire UCF community, including the current 59,770 students and 1,965 teaching faculty. Because UCF will gain perpetual rights, the collection will meet the study, instructional, and research needs of the UCF community into the future. The content aligns with many UCF course offerings and will support programs in nearly all disciplines. Given the many subject areas covered within these primary source databases many UCF students and faculty will use the content for research and educational purposes. A minimum of 16,174 students will directly benefit from content because their major or minor is focused in areas including language and literature, political science, history gender studies, and the arts. Currently, UCF has British Periodicals I and II, but its collection of American pamphlets and periodicals is incomplete. Through the purchase of the Shaw-Shoemaker collection, UCF teachers and students can extensively research westward expansion, the development of American arts (literature, music, painting, etc. ), the progression of American political thought and almost every other aspect of America during the early national era. In addition to books, broadsides and pamphlets, the collection includes published reports and the works of many European authors reprinted for the American public. Moreover, a large number of state papers and early government materials—including presidential letters and congressional, state and territorial resolutions—chronicle the political and geographic growth of the developing American nation. The history of Leonora de Valesco, a Spanish lady, who, in an expedition against the Spanish islands in the West-Indies, was taken prisoner by the British; forced on board a ship of war, and detained several years by the commodore.–Her sufferings were extraordinary;–her adventures surprising;–her deliverance remarkable. The heroine appears amiable even in the midst of combat, and fighting with the bravery of a veteran. Resignation, fortitude, and constancy, triumph ever [sic] every obstacle. Translated from the admired works of Madame de Gomez. Lectures on natural and experimental philosophy, considered in its present state of improvement. Describing in a familiar and easy manner the principal phenomena of nature; and showing that they all co-operate in displaying the goodness, wisdom, and power of God. By the late George Adams, mathematical instrument maker to His Majesty, &c. In four volumes. Illustrated with forty three large copperplates, elegantly engraved. The Reprobate’s reward: or, A looking-glass for disobedient children, being a full and true account of the barbarous and bloody murder of one Elizabeth Wood, living in the city of Cork, by her own son, as she was riding upon the road one day with articles for sale to market. How he cut her throat from ear to ear; as also how the murder was found out by her apparition or ghost; the manner of his being take; his dying words at the place of execution: with a true copy of verses written by his own hand in Cork jail being a warning to all disobedient children to repent, and obey their parents. Cynthia: with the tragical account of the unfortunate loves of Almerin and Desdemona. A novel. Illustrated with a variety of the chances of fortune; moralized with many useful observations, whereby the reader may reap both pleasure and profit. The politics of Connecticut: or, A statement of facts, addressed to honest men of all parties, religious and political, in the state: particularly to the mass of community, a bold and hardy yeomanry, who compose the flesh and muscle, the blood and bone of the body politic. By a Federal Republican. Jacobin modesty! Again the cry of Tory is raised against the Federalists by the modest Jacobins … The following affidavit … will prove, that Gabriel V. Ludlow, secretary to one of the Democratic meetings for the present election, and the person they appointed in the first ward to challenge Federal votes, is at this moment a half-pay British officer. Additional Departments and programs that would use this database include: African Studies, Women’s Studies, and the Department of Rhetoric and Composition. Class assignments can include the following: locating and discussing key historical primary documents concerning an event or issue; abstracting and reviewing document content; annotating a selection of materials to accompany a reading; and creating a bibliography of source materials regarding a particular topic such as the anti-slavery movement, women’s rights, sectarian religious belief, or the emergence of political parties. The Readex Report provides a regularly updated source of teaching suggestions. Use of the database will also sharpen students’ information fluency skills and ability to do research online through advanced search features. One can easily look at the original document (up to 300 percent magnification) and download in PDF or TIFF Formats as seen in the example below. history courses and for thesis research. Finally, they will provide access to critical sources for faculty research as well. Primary source evidence from the past is a key part of teaching and researching early American history and having access to this collection will expand learning opportunities exponentially. This collection provides a variety of resources for helping students better understand the formative period of the United States and its role in the world during the late eighteenth and early nineteenth centuries. Unlike many collections that focus only on a singular aspect of the period, this database contains materials that pertain to the social, political, cultural, diplomatic, and institutional developments in the period as well as the various peoples and processes involved in the westward expansion of the United States. I would use this collection in both my GEP courses on U.S. history and my upper division major courses on colonial America, the early republic, Jeffersonian American and U.S. frontiers/borderlands. This is a wonderful collection of material, and I can see all of the programs in our department (Philosophy, Humanities & Cultural Studies, and Religion & Cultural Studies) as having interest in this. Both students and faculty will be able to see first-hand the development of a distinctive American voice and perspective in philosophy, religion, and culture. The fact that the format is digital only adds to its usefulness, for courses of all modalities and for digital research. I support the purchase of Early American Imprints, Series II: Shaw-Shoemaker, 1801-1819. This database meets a vital need for students studying the early national period. One of the challenges of teaching about this period is the availability of texts for which copies exist only in inaccessible archives. This database makes available every book, pamphlet and broadside published in the U.S. during the first decades of the 19th century. Students in several graduate and undergraduate courses in American literature, history, and cultural studies would benefit from this database. For the first time, students at UCF could pursue research projects on archival texts formerly available only to those near Philadelphia and Boston. The accessibility of these texts would facilitate original research projects on little known but historically and culturally significant texts from the early national period beyond 1800, where our current holdings end. Students in the following courses will use this database to complete research projects in literature and the digital humanities. AML 4300 (Major American Authors), AML 4101 (American Novel), AML 3031 (American Literature I), AML 3286 (Early American Women’s Words), LIT 6216 (Issues in Literary Cultural, and Textual Studies), and LIT 6936 (Studies in Literary, Cultural, and Textual Theory), that no longer in print because it provides access to materials that are not available anywhere else online or in print. Significant is the inclusion of many texts by women and people of color not available in mass market anthologies. Projects include artifact inventory, contextual annotation, material culture annotation, bibliographies of primary sources, and writing research papers for presentation at national conferences and for publication. This database is especially relevant to several UCF courses in American literature, culture, the arts, history, politics, medicine, law, journalism, philosophy, and science. 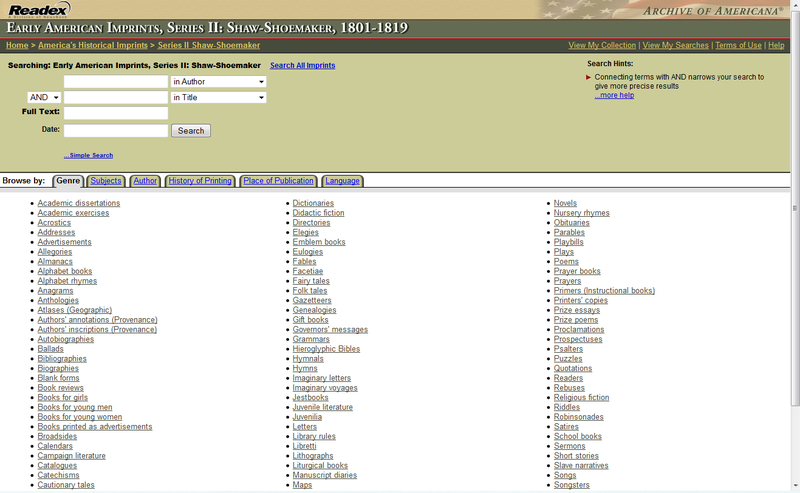 I strongly support the purchase of the Shaw Shoemaker database. It contains many valuable documents that will help professors and students research and learn about American government and state government. The time period covered by this database (the early 1800s) is particularly important for the development of American political thought and American Democracy. In addition to research, a number of political science professor will use these primary source materials in the classroom to give students an unfiltered look at early 19th century thought. Students in a number of political science classes would access this archive for class projects and independent research. Students will benefit greatly from having access to the original documents that are found in this collection – it is far more exciting and memorable to read and see primary sources than it is to only read about them in text books. The Shaw Shoemaker database will be a tremendous addition to the UCF holdings and I am confident it will be used frequently by undergraduates, graduate students, and professors. The UCF Libraries will measure the success of these four Readex databases through usage reports and satisfaction surveys. COUNTER reports (an industry standard format for online usage statistics) tracks which titles are used and the number of articles downloaded. There is strong evidence that the content from these collections will be heavily used across several disciplines by students and faculty. Similar primary source databases have shown steady usage and growth in number of accessions and downloads as word spreads about the benefits to students and researchers. It is expected that usage will increase by 10% to 20% per year in the first three years. The requested funds ($105,648), in combination with the $5,000 cost share from UCF Libraries, will cover the one-time cost of Early American Imprints, Series II: Shaw-Shoemaker, 1801-1819. There is an annual access fee that is standard for digital collections of this quality. The annual fee of $3,334 will be covered from the existing library materials budget. These titles are hosted by Readex, so there will be no new demands on UCF staff or infrastructure. Dictionary of American Regional English will be purchased for a one-time fee of $5,500 ($5,000 from Technology Fee funds and $500 from UCF Libraries), securing unlimited, simultaneous access and perpetual rights to all content.